Spray stencil ink suitable for permanent, waterproof, fast drying, bold marks on most surfaces. Available colors - Black, Red, Blue, Yellow, White, Orange, Green and Tan Mark-over. ANBK Marsh Black 11oz Stencil Spray Ink Can, 6 cans min. 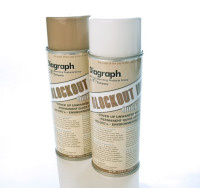 Black Marsh 11oz Stencil Spray Can. Min order 6 cans. ANG Marsh Green 11oz Stencil Spray Ink Can, 6 cans min. ANG Green Marsh 11oz Stencil Spray Can. Min order 6 cans. ANO Marsh Orange 11oz Stencil Spray Ink Can, 6 cans min. ANO Orange Marsh 11oz Stencil Spray Ink Can. Min order 6 cans. Marsh 11oz Blue can of stencil ink. Min order 6 cans. ANTMO Marsh Blockout Tan, Min 6 cans. 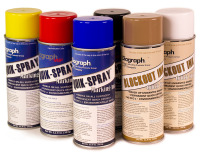 Choose one color, Marsh Aerosol Stencil Spray Ink, 12/Case. Choose black, blue, green, orange, red, white and yellow.